In this episode of The Finance Frontier, host Eric Hathaway speaks with Maelis Carraro, program manager of Catalyst Fund. Their lively discussion focuses on how fintech companies are using innovative approaches to address the financial needs of billions of unbanked and underbanked consumers. From advancing payment technology to creating platforms that let lenders and farmers calculate the value of rural agriculture, fintech innovation is helping to meet the needs of the world’s poorest and most financially excluded. Listen to podcast and view full transcript here. Alternative credit scores — using data, in part, from customers’ smartphones — will be migrating from emerging economies to the U.S.
New York, July 31, 2018 — Catalyst Fund has added another 5 “inclusive fintech” companies to its early-stage accelerator, now totaling 20 companies that leverage innovative technologies, in order to deploy financial service solutions in emerging markets where there is enormous pent-up demand. Mobile technology, machine learning, AI, and blockchain are making it possible and profitable to build the full range of financial services for previously underserved populations in places like Africa, India, and Southeast Asia. Catalyst Fund’s highly successful model de-risks companies and gets them investment ready — the 11 companies that sought follow-on funding after completing the program secured an average of $1.3 million each. Inclusive Fintech refers to a wider range of modern financial services, beyond bank accounts and digital transfers, that are tailored to the unmet needs of emerging market customers to ensure adoption and to enable users to move up the financial ladder. ● Hover’s proprietary and patent-pending technology enables mobile developers to turn an existing communications protocol, USSD, into an invisible transport layer, allowing the facilitation of in-app mobile payments so that users who can’t access or afford data plans can still connect to transact. ● PayAgri is an agri-fintech startup that brings together key players in the Indian agriculture value chain to facilitate trade and funding flows to low-income farmers who struggle to access funding and establish credit history. ● Leaf was founded with the mission of helping refugees transfer their assets across borders safely using blockchain technology. ● Sokowatch is an e-commerce platform for African informal retailers that offers on-demand and free delivery of store products and credit lines to address common stockouts, lack of access to working capital and business management tools. The accounts of one-fifth of banked individuals worldwide are inactive. In India 80 percent of the population has a bank account but 48 percent of those accounts haven’t had a transaction in the past year. Another 190 million Indians remain unbanked. Participating Catalyst Fund cohort companies must first be nominated by a sponsoring investor in order to be considered, and a pre-selected group of investors can make follow-on investments once the companies have been de-risked by completing the program. The program draws on BFA’s business intel from 12 years of using finance to create solutions for low-income people in emerging markets. Companies receive flexible grant capital, tailored technical assistance, mentoring by potential investors and access to networks of follow-on investors. A fifth cohort is planned for later in 2018. BFA is a global consulting firm specializing in using finance to create solutions for low-income people. Our approach is to seek out, create and implement financial solutions to help people manage challenges and seize opportunities. We partner with cutting-edge organizations that touch the lives of low-income consumers such as financial institutions, fintech companies and information providers. In creating solutions, we integrate our deep expertise in customer insights, business strategy, new technology, and growth-enabling policy and regulation. Founded in 2006, BFA’s clients include financial institutions, technology companies, donors, investors and policymakers. BFA has offices in Nairobi, Delhi, Boston, Medellín and New York. For more information, please visit: www.bfaglobal.com. Catalyst Fund is a philanthropic grant fund at the forefront of Inclusive Fintech, an initiative supported by the Bill & Melinda Gates Foundation and JPMorgan Chase & Co. 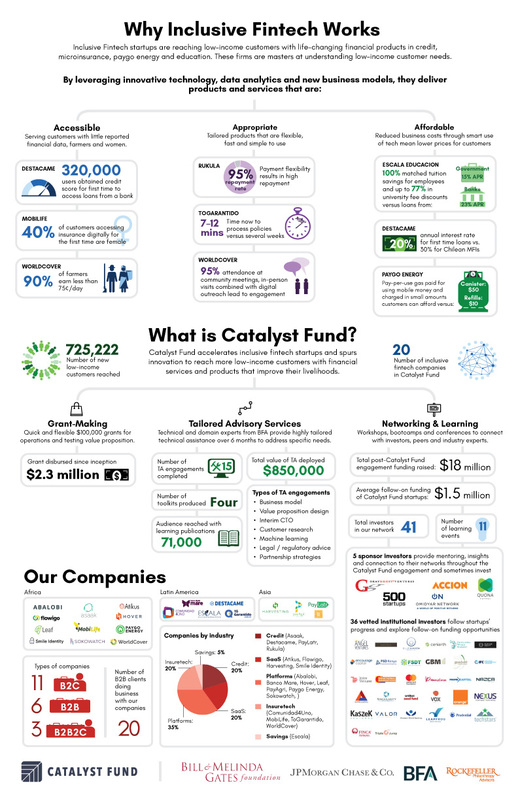 Since 2016, as a project managed by BFA and fiscally sponsored by Rockefeller Philanthropy Advisors, Catalyst Fund has been accelerating startups developing financial services for the needs of the low-income demographic. We also seek to build up industry knowledge and customized tools from our direct work supporting and accelerating that early-stage startups building digital financial services for the next billion. Full article on WSJ here. Full article without paywall here. There are a growing number of financial technology companies starting up across the globe in an effort to find ways to harness technology to reach underserved or unserved customers. While financial inclusion presents both a development and a business opportunity, there are challenges that constrain the ability of this cadre of entrepreneurs. These challenges include funding, regulations, appropriate technology, human resources and building trust. To help address part of the funding gap, JPMorgan and the Bill & Melinda Gates Foundation launched the Catalyst Fund in 2016. Impact investors help identify innovations or companies that are not yet investment ready — those companies get derisking grant capital through the fund and customized technical assistance. It is that customized help that sets the fund apart from many accelerators or incubators, which often focus on more general business skills- continue reading. Escala Educación was recently featured in the Colombian daily for economics and business news. Full article in Spanish here. Catalyst Fund announces partnership with PreSeries, an early investment platform founded by BigML and Telefonica Open Future_, that employs machine learning to predict early on, successful inclusive fintech startups. New America - Was This The Year of Financial Inclusion? 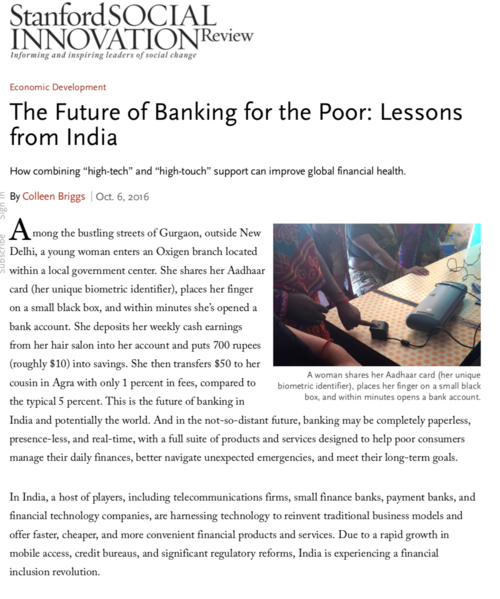 Catalyst Fund mentioned in the New America Weekly blog post on "Was this the Year of Financial Inclusion?" Innovative collaboration will provide funding and mentorship to early-stage digital financial services ventures. Mention of Catalyst Fund in the NY Times Article covering financial inclusion efforts in the US.